Outlook Express is POP email client manager software that is used to read emails in local computer and store mails to read anytime in your system. We can configure any email service in Outlook Express like Gmail and Yahoo that supports POP system. Mails are your important data so you have to keep them safer way. Sometimes your system can be crashed or attacked by viruses. Before you make format or reinstall your system, you must backup your system and also Outlook Express Mails. First you need to copy the mail store folder of Outlook Express for backup process. If you don’t know about that process, here is the easy way to backup all contents and mail accounts of Outlook Express. 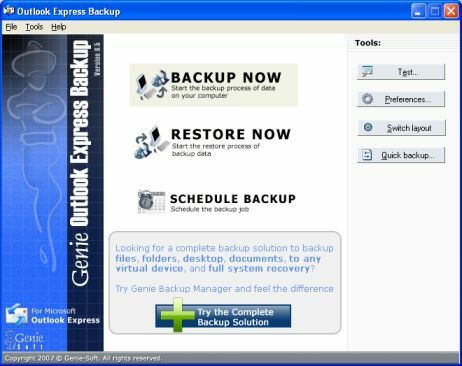 Geniesoft Outlook Express Backup is free software to backup and restore all Outlook Express mails, mail accounts, folders and contacts. 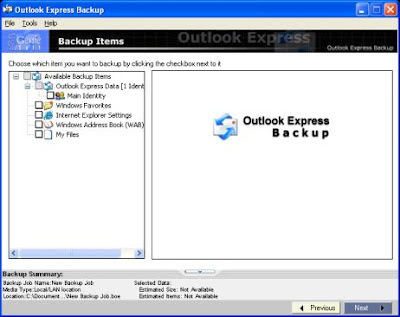 You can backup all identies of Outlook express to local system or restore entire backup to another new computer to use all previous data. You can backup to LAN, DVD, Pen drives and also FTP supported. Backup all contents to an Exe file is a pretty thing and password protect support also provided.